In an effort to support the development of Islamic finance research industry, Meezan Bank rewarded Raheel Jawed, a student of Institute of Business Administration (IBA), one of the leading business schools of the country, for securing first position in 'Islamic Banking and Finance' course. Jawed was awarded with a cash award of Rs 50,000 by Meezan Bank President & CEO Irfan Siddiqui at a prize distribution ceremony organised at the bank's head office on March 30. Siddiqui praised the institute for its valuable contribution to Islamic finance education. The move forms part of the bank's efforts to encourage participation and interest of emerging and new talents in Islamic banking and finance. 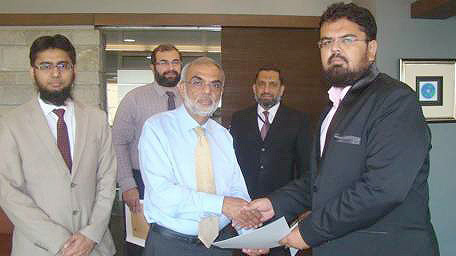 Referring to the recent activities at IBA Centre for Excellence in Islamic Finance (CEIF), a joint effort of Meezan Bank and IBA, Siddiqui said that this centre is positioned and capable of leading the way forward, developing outstanding leaders who can deliver exceptional Islamic banking services and contribute to the industry at large. The initiative comes within the bank's strategy to foster high quality talent for the Islamic banking industry. Currently, Meezan Bank focuses on university students in order to garner their interest towards Islamic finance during their graduate and under-graduate studies. The Islamic banking course offered at IBA would enable students to realise the centrality of Islamic finance as a sub-discipline of finance. Through such and similar initiatives, the bank aims to contribute to the Islamic banking talent pool.